Striving to improve the quality of life for all the residents of the Indian River neighborhoods of Chesapeake, Virginia, by promoting and preserving a healthy and clean river, shorelines, parks, and green spaces connected to the surrounding community. 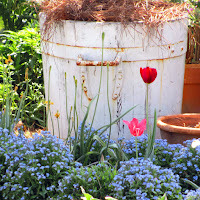 Spring is here and the leaves are bursting forth. Eagles are soaring over the river and the egrets are setting up their nests. April is the month for our big BioBlitz at Indian River Park where we'll try to see how many species of flora and fauna we can find in the park. We hope you can come out and join us for this fun and educational event. Come out for a day of free nature and wildlife programs at Indian River Park. Join expert guides on a variety of hikes to explore the park and document as much of the plant and animal life present. 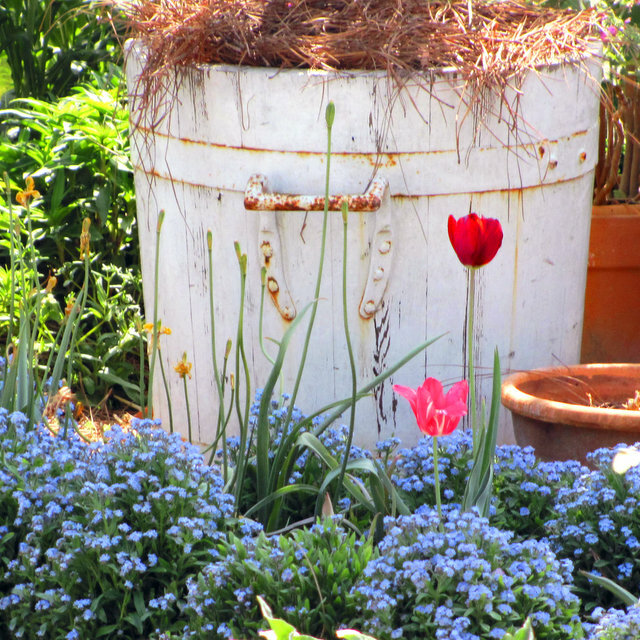 At our next regular meeting, Norfolk Master Gardener Lorraine Schreiber will talk to us about how the French kitchen garden intermingles vegetables, fruits, flowers, and herbs. Come and find inspiration in its intimate and sensual style, complicity with nature, and charm. There will be light refreshments and door prizes after the presentation. The meeting starts at 7 PM in the Social Hall at the Oaklette United Methodist Church, 520 Oaklette Drive. And we offer a big Thank You to the volunteers who braved the blustery weather on March 19th to help with our quaterly Indian River Road Cleanup. We did about a mile along the road and and under the bridge and collected 14 bags of trash including bottles, food wrappers, wind blown plastic bags, and lots and lots of cigarette butts. We're open to suggestions on how to best get the word out that cigarette butts are litter and folks shouldn't just toss them out their car window. 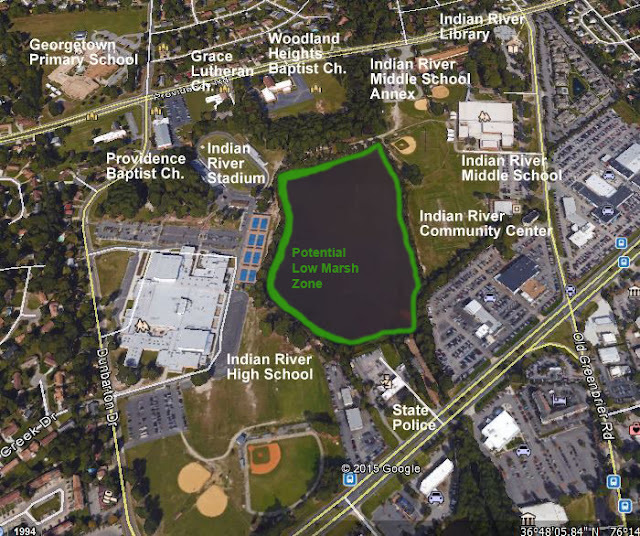 This paper <link> outlines the proposal to create fresh water vegetated wetlands at the 21 acre stormwater retention pond known as Indian River “Woodland” Lake. The lake was created in the mid-1960’s when a borrow pit was excavated during the construction of I-64. Along the shores of this lake, located in the Indian River section of Chesapeake, Virginia, are various civic facilities including Indian River’s High School, Library, Middle School, Community Center, and the State Police Division Headquarters. The lake lies on the primary drainage of the heavily developed Greenbrier section of Chesapeake. The drainage from Greenbrier is presumed to be a major contributor to the Nitrogen, Phosphorous and Sediment pollution to the Indian River, a major tributary of the Eastern Branch of the Elizabeth River. This pollution load is a major contributor to the failing water quality grade of the Indian River, which received an “F” in State of the River 2014 Scorecard for the Elizabeth River. The concept is to establish vegetated wetlands in the shallow waters along the shoreline of the lake using a combination of native Nuphar lutea ssp. advena (yellow pond lily), Nymphaea odorata (fragrant pond lily), Peltandra virginica (arrow arum), Pontederia cordata (pickerelweed), and Sagittaria latifolia (arrowhead) and possibly bald cypress trees. The lilies in particular could be effective wetlands vegetation for the lake since they will colonize the lake bottom out to a water depth of about 6 feet. With approximately 4000 feet of shoreline, allowing the yellow pond lily, flagrant pond lily, arrow arum, pickerelweed, and arrowhead to colonize the zone extending 20 feet offshore (on average) would create about 2 acres of wetlands. Such a marsh should provide significant improvement of water quality by absorbing Nitrogen and Phosphorus from the water during the spring and summer growing seasons. The plants would also trap Sediment. The marsh would also provide valuable habitat for fish, birds, aquatic insects, snakes, turtles, frogs, crayfish, salamanders, and other water creatures. It can also provide a living classroom for students at the adjacent Indian River High School and Indian River Middle School; studies show that students generally perform better when they are in a setting with exposure to green space. The general public would also be able to access a trail from the adjacent Indian River Community Center overlooking the east and north shore of the restored wetlands. The resulting lake and wetland would be similar to the environment found at Lake Whitehurst adjacent to the Norfolk Botanical Garden. The restoration could also serve as a role model for the restoration of other storm water ponds around the region. Upcoming events - See our calendar page for details. Unless otherwise noted, Copyright by Friends of Indian River. All Rights Reserved. . Picture Window theme. Powered by Blogger.